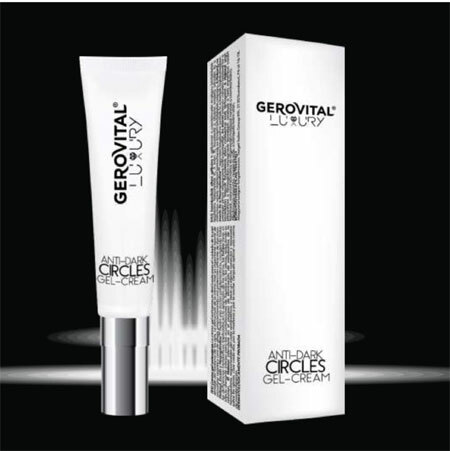 The Gerovital Luxury Anti Dark Circles Gel-Cream addresses all major signs of aging under and around the eyes. Instantly depuffs and smooths the eye entire eye area, reduces the appearance of dark circles and fine lines. Squalane and bee wax emolliate and prevent ongoing loss of hydration leaving skin moisturized, plump and soft. The stainless steel tip delivers a cooling application while supporting microcirculation to enhance the product’s benefits. Haloxyl, Escin and Neurophroline™ all have a complementary action, correcting all the metabolic deficiencies involved in the occurrence of the dark-circles. Escin has an intensive drainage effect for the accumulations of fluids in the dark-circles, decreasing their volume. Haloxyl™ is effective at reducing bags and dark circles under the eyes due to its ability to boost blood circulation. It reinforces firmness and tones the eye area, has a concealing effect fading dark circles color, treats local inflammation. Usage: Apply twice a day, morning and night. Squeeze a small amount of product onto applicator tip. Gently pat directly on bags and dark circles. Neurophroline™activates the release of a natural calming neuropeptide acting on mood, and visibly improve skin tone within two weeks. Apply twice a day, morning and night. Squeeze a small amount of product onto applicator tip. Gently pat directly on bags and dark circles. INGREDIENTS: AQUA, SQUALANE, GLYCERYL STEARATE, PROPYLENE GLYCOL, NIACINAMIDE, CETHYL ALCOHOL, DIMETHICONE, ESCIN, TOCOPHERYL ACETATE, GLYCERIN, N-HYDROXYSUCCINIMIDE, CHRISIN PALMITOYL OLIGOPEPTIDE, PALMITOYL TETRAPEPTIDE-7, DIPALMITOYL HYDROXYPROLINE, PROPANEDIOL, TEPHROSIA PURPUREA SEED EXTRACT, CERA ALBA (BEESWAX), PEG-75 STEARATE, CETETH 20, STEARETH-20, HYDROXYETHYL ACRYLATE / SODIUM ACRYLOYLDIMETHYL TAURATE COPOLYMER, ISOHEXADECANE, POLYSORBATE 60, DIMETHICONE CROSSPOLYMER, PHENOXYETHANOL, DECYLENE GLYCOL, CAPRYLYL GLYCOL, MICA, TIN OXIDE, SODIUM POTASIUM ALUMINIUM SILICATE, CI 77891, SILICA, TETRASODIUM EDTA, SODIUM HYDROXIDE, TOCOPHEROL, HYDROGENATED PALM GLYCERIDES CITRATE, GLYCINE SOJA OIL, PARFUM, BENZYL SALICYLATE, LIMONENE, LINALOOL, CITRONELLOL, CI 77492, XANTHAN GUM, SODIUM CITRATE, POTASSIUM SORBATE. Improves elasticity, smoothes lines and wrinkles. Supports all stages of the dermal reconstruction.